Have you purchased the latest issue of Primitive Quilts and Projects? 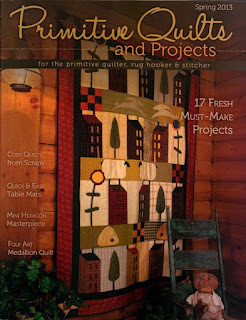 There are lots of wonderful projects in the spring 2013 issue, one of which is from our lovely blogger Nancy Moore of Tom Miner Quilts and Folk Art. Check it out! It's a lovely magazine for those into Prim! 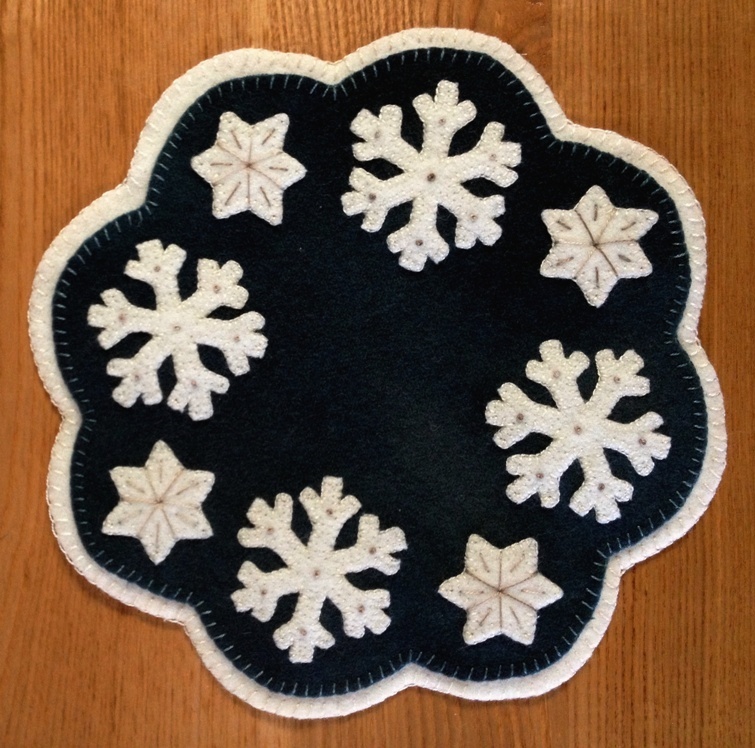 The gals that are members of my clubs at Fibre Junction are always up for a challenge, and why not! It just makes life more interesting. 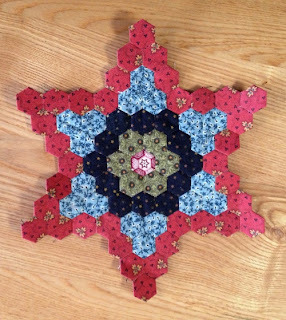 Diane and Kitty decided to take on the challenge of making the "Stars in the Garden" quilt by Vicki Olsen and Jill Shaulis of Yellow Creek Quilt designs. 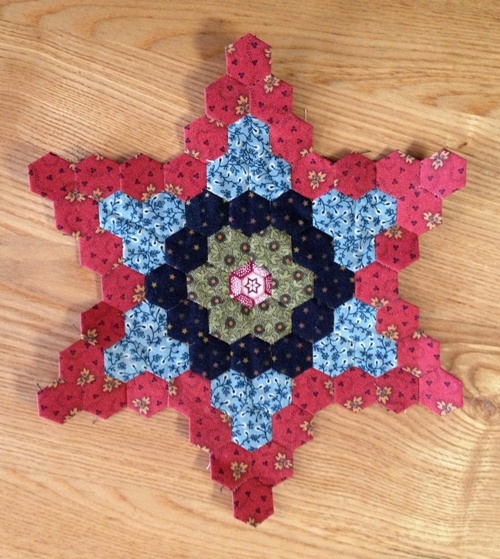 The quilt is on page 92 of Spring 2013 issue. I'm on it! This is what I have accomplished so far! It might not look like much but, honestly, I have approximately nine (9) hours of hand work in that. And .... I have four (4) more to do! The finished quilt will measure 15 3/8" by 19". Yea, it's a challenge alright .... a fun one at that! Last week was quite the challenge! 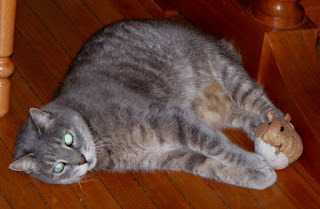 Not only did we loose our beloved Maggie, but DH had a surgery scheduled to dislodge scar tissue. If you recall, he chiseled his left index finger last spring. Well, you know how things don't always turn out as expected? Once they began, they became aware that one of the tendon was only partially attached. The scheduled surgery did not go as planned. We do not have a happy camper! 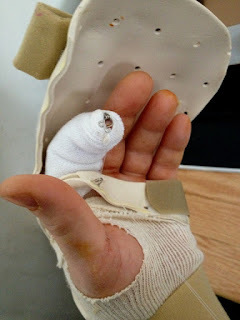 The surgeon is being cautious and does not want any tension on the tendon. I thought the gadget was kind of neat! Who would have thought that a hook and eye notion would be used outside the sewing world? As you can imagine, it is quite uncomfortable. Month 11 and 12 are what I would consider the finishing blocks. I am anxious to piece the quilt top and get it machine quilted. It is sweet! Thank you for stopping by! Hope you are all having a wonderful week! Cheers!